The primary goal of Ursa is to devlop reference designs on behalf of Mavericks Civilian Space Foundation (see the mission webpage for more information on the team's mission statement). However, the designs must be tested and proved before being accepted, which is accomplished by flying research vehicles. The ultimate goal of Team Ursa's internal research vehicle flights will culminate with the Ursa 2.4 which will be a sub-orbital space shot. The team expects that many referene designs of value will emerge from these efforts, including: high altitude recovery systems; systems that makes packaging people's payloads seamless (the PPU or Payload Packaging Unit is already underway, click here); a reliable attitude control module; ruggedized GNC electronics; and possibly other contributions to the Mavericks repository. The chart above lays out the series of vehicles that the team hopes to design and eventually fly in order to meet these goals. We are in the beginning stages of the project, having most recently launched the first Ursa 2.1. With the Ursa 2.x series of research vehicles the team has made our designs more modular and easier to replicate. Ursa 2.1 is the first model of this series, eventually consisting of 4 vehicles; culminating with the Ursa 2.4 which will have full sub-orbital space capabilities. The Ursa 2.1 has the specific tasks of testing PPU's (Payload Packaging Units), separation rings, and low altitude recovery. 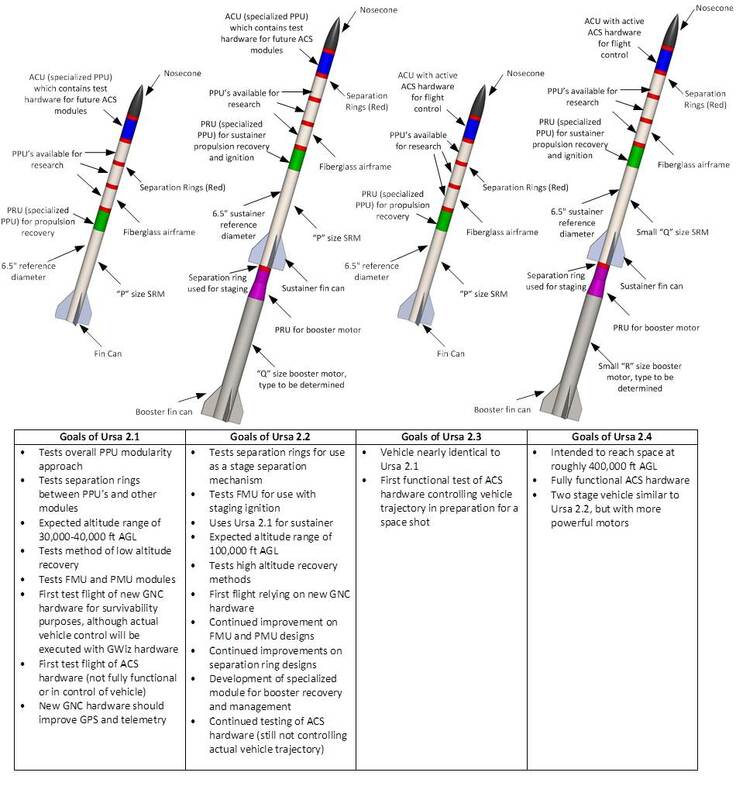 Once the Ursa 2.1 launch vehicle has successfully proven all onobard reference designs, the team will move forward with Ursa 2.2, a two stage research vehicle that uses the Ursa 2.1 as the sustainer. The Ursa 2.2 will test high altitude recovery reference designs and will most likely reach in excess of 100,000 ft. Ursa 2.3 will test the attitude control system (ACS) reference designs for the first time, the vehicle itself will essentially be the same as an Ursa 2.2. Lastly, Ursa 2.4 will receive much larger motors and will bring 50 lbm all the way to space (390,000 ft). Each of these research vehicles will be working toward proving specific reference design prototypes. Ursa hopes that each of these designs can be eventually perfected to the level sufficient for submittal to the Mavericks. The separation rings have already been adopted into official Mavericks references and will be used in upcoming education programs.